NEW YORK—The future in peer-to-peer consumer energy exchange is here. The world’s first small-scale power grid, a microgrid, to use consumer blockchain transaction (think Bitcoin) has begun in New York. The first paid energy transaction between two individuals happened on April 11, on President Street, Brooklyn, where long-term resident and social justice activist Eric Fruman sold excess renewable energy from his solar rooftop installation to ex-Energy Star National Director Bob Sauchelli. This was the beginning of a relationship between five homes on one side of President Street, producing energy and selling their excess, to five homes on the other side. Bitcoin is to blockchain like Kleenex is to tissue. 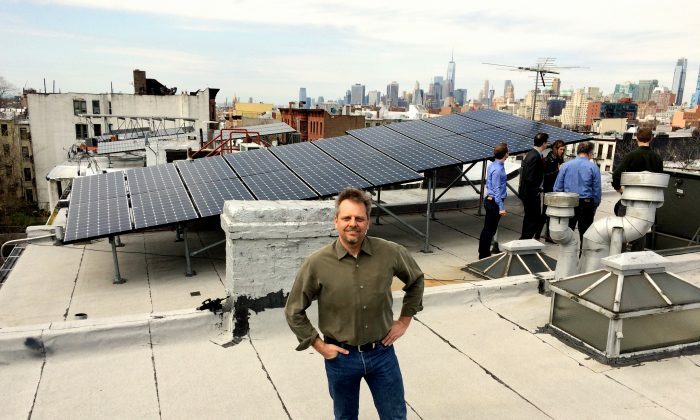 The Brooklyn microgrid is a small-scale solar venture in the Gowanus and Park Slope neighborhoods. It enables residents to trade and sell solar energy locally, via rooftop solar setups without the involvement of national utility companies. Instead they rely on a New York startup called TransActive grid. TransActive grid (TAG) is a joint venture between LO3 Energy, founded by Lawrence Orsini, and consensus systems, which allows customers to exchange energy between each other using a combination of smart contracts and a blockchain software called Ethereum. Blockchains are programs that make it possible to create digital ledgers. They are favored by the financial market due to their security, transparency, and ability to run in real time. “You know exactly what happened, when it happened, who consumed what, and who produced what,” said Orsini in a telephone interview. New York Governor Andrew Cuomo started the “Reforming the Energy Vision” strategy after Hurricane Sandy left two million people in New York without power in 2011. It is a bid to clean up the state and promote better energy efficiency in the form of microgrids, roof-top solar installations, and so on, as well as providing affordability and a wider choice for customers in how they manage and consume their energy. In Feb. 2015, Cuomo requested adding a $40 million incentive for a number of microgrids to be designed that could run parallel to the national grid. In the event of a storm, like Hurricane Sandy, they could separate and become independent from the main grid so that if the main grid gets knocked out, power remains for selected areas. According to Orsini, 30 percent of the energy content of the resources that are taken from the ground are lost in the production of energy in power plants. And another 7 percent is lost when the energy is transported from the power plant to a remote building. Connecticut became the first state in the United States to launch a microgrid program in 2003, pledging $18 million in grants to over nine projects throughout the state. Other innovators in sustainability are California, which has pledged $26.5 million in microgrid projects in 2014, and has its goal set at having zero-net energy constructions in all low-rise residential buildings by 2020 and all new commercial buildings by 2030. Zero-net Energy (ZNE) means that a building produces as much energy as it consumes over the course of a year. TransActive grid hopes that the future in energy exchange will rely less on fossil fuels and more on renewable energy in a more community based environment. “We’re not at a place where we have to have giant utility plants that are remote from us anymore. Technology has reached a point where it can live right next to us, on top of our houses across the street and have beneficial environmental impacts,” Orsini said.